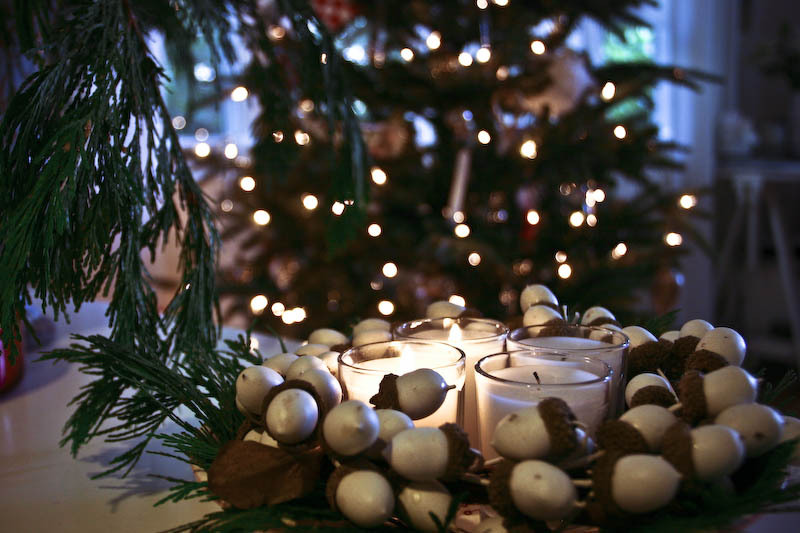 In Danish homes, Advent is celebrated with the arrival of the season’s first decoration-a beautiful Advent wreath of evergreen boughs that holds four tall, white or red candles. The wreath is hung above or set on the dining room table. On the first Sunday before Christmas, one candle is lit, and the most festive and celebrated season of the year begins. On the second Sunday of Advent, the first candle on the wreath and one more candle are lit. The ritual continues Sunday after Sunday until on the last Sunday before Christmas all four candles are lit together. My mum, like most Danes, has always made the Advent Krans (she goes on walks for all the greenery and hand makes the candles) before the first Sunday of December. It was always hung above our coffee tables as that’s where everyone gathered (Sunday is a huge visiting day for Danes – even more so during the Holidays) and lit every Sunday until Christmas to celebrate each other and the countdown to Christmas. But despite an upcoming move I’m going to try to make one (more like Liselotte’s with a tray and votive) so that each Sunday I can lit mine, relax, and enjoy the simple beauty of this tradition. Because being in Los Angeles I often feel so removed from the Holidays so this photo is a reminder that participating in them doesn’t have to be hard.